It’s a good overview but there’s so much more that can and should be said! 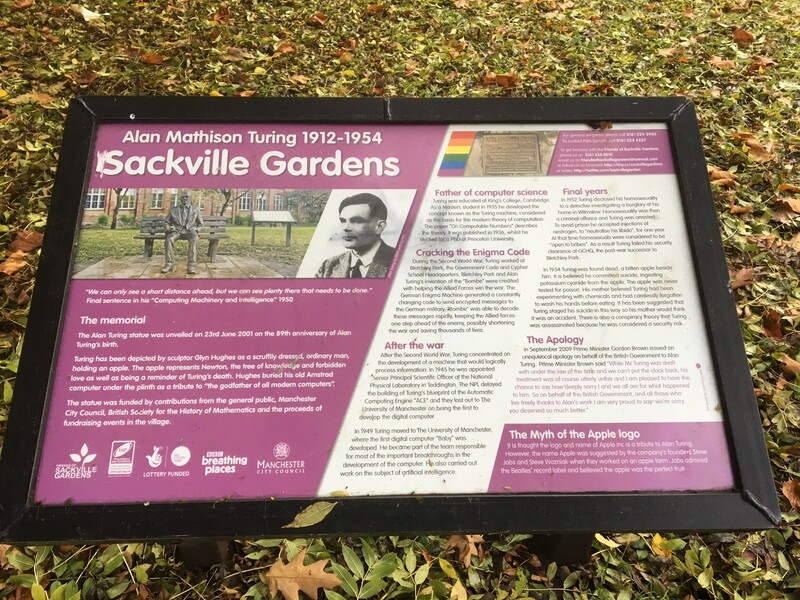 Turing’s memorial is close to the centre of the park. 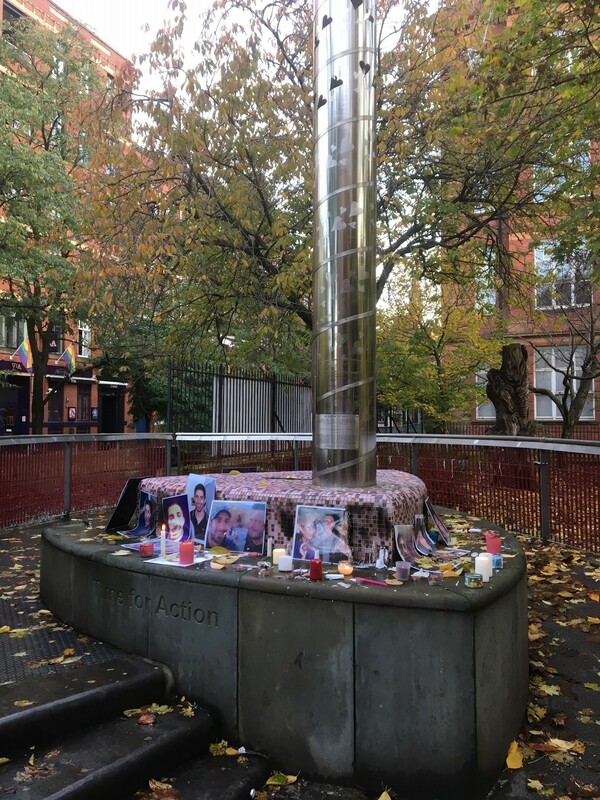 At the end, nearer to ‘The Village’ on Canal Street, stands the ‘Beacon of Hope’, the UK’s only fixed memorial to those living with, or already lost to, HIV/AIDS. Both are frequently adorned with flowers, photographs and candles. If you’re ever in the area, go along. It’s a heart-breaking reminder – on many levels – of how we often only value things of beauty when they’re gone. 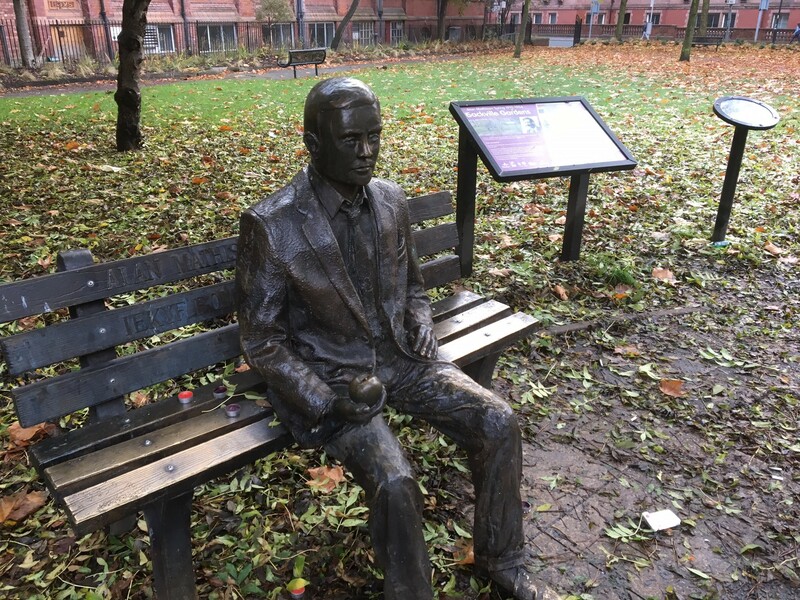 But finishing on a lighter note, it’s just a small shame that the Turing memorial sculptor couldn’t get the ENIGMA coding example quite right! Both the original text, ‘Founder of Computer Science’, and the supposed coding, ‘IEKYF RQMSI ADXUO KVKZC GUBJ’, have a letter ‘U’ in the 14th position and a proper ENIGMA machine wouldn’t have allowed that. Turing would have enjoyed pointing this out! This entry was posted on Monday, November 14th, 2016 at 5:22 pm	and tagged with Alan Turing, Bertrand Russell, Enigma, Manchester and posted in Academia, Algorithms, Computer Science, Philosophy, Politics. You can follow any responses to this entry through the RSS 2.0 feed. Having read your post, I will difenetely stop by next time.